Since the 18th of May, 2014, we have been discussing, sharing many ideas and thoughts about photography, old and new. The heritage of photography as compared to the technological leaps that modern photography has accomplished. It is a fascinating subject. Photography as was prevalent in the 1850′s and 60′s, and how it was preserved in those times; or photography of the 1900s and the range of subjects it covered. There are so many wonderful aspects to photography, which were shared in those hours marking the launch of a well-researched and compiled publication from our own Maharana Mewar Historical Publications Trust. The pictorial book was titled “Long Exposure – The Camera at Udaipur, 1857-1957″ and it has exposed readers to a whole new world. Mewar of the last century, and the capital-city of Udaipur, were not strangers to technology, especially photography and all the technical paraphenalia it entailed. 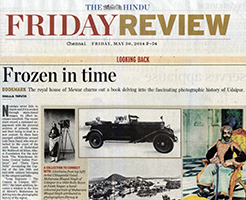 As we launched the publication on the International Museum Day in New Delhi, there were several journalists and writers who remarked that, through photography, we are able to see what life was like in Princely India and Mewar. The rare and archival photographs present an array of portraits of the Maharanas of Mewar, often with important State guests. The book has much to offere those who are more technically oriented. They get to know and read about the kind of cameras in use and how photography was integrated into the life and times of the Maharanas of Mewar. Of course, there are many questions which remain unanswered, but it is wonderful to see that entire age come alive through archival photographs. Many people are pleasantly surprised that our record-keeping in Udaipur – photographic, architectural, Palace proceedings – were very elaborate. Moreover these records have been painstakingly maintained, generation after generation. Rarely was anything overlooked; needless to say, the important events, festivals and occasions merited more share of attention. It is important for us to remember that our forefathers were meticulous in maintaining records. There were entire administrative sections devoted to archiving and preserving the documents which pertained to every aspect and facet of life. We need to learn from them, and utilize the modern information technology, to preserve and share the legacies with the new generations. The role we have to play is that of a ‘bridge between generations’. It is yet another responsibility we shoulder as Custodians of the House of Mewar. During our interactions, we shared the information that the Pictorial Archives of the Maharanas of Mewar are being catalogued and digitized, over the years. There is constant work happening on those fronts. Our research institute, library are repositories of different kinds of records. We encourage scholars, researchers and students to seek the requisite permissions and use these store-houses of historical knowledge which has been handed down over the generations. The pictorial book, “Long Exposure – The Camera at Udaipur, 1857-1957″, has been published by the Maharana Mewar Historical Publications Trust, under the aegis of Maharana of Mewar Charitable Foundation, Udaipur. It has been authored by Pramod Kumar KG and Mrinalini Venkateswaran with contributions by S Girikumar and Lauren Power.